Today is Alex and my second anniversary. Some longtime readers might remember that Alex and I met through our blogs–yes, we both used to whine publicly about our laughably bad dating lives and, yes, are really glad that phase has passed. Some newer readers might demand to know why they haven’t been privy to this information and the truth is, though Alex and I have been together for almost three years, I still haven’t found a non-awkward way to say “We met on the internet.” What usually happens is that I try to reduce my own discomfort with the way it must sound by, well, making it sound much worse: “In a chat room!” I’ll add, and then “About kittehs!” and then “No, wait! About polyandry!” Once big mouth strikes again, I can’t shut her up and I talk myself into a deeper and deeper hole: “Just kidding! We met on JDate!” “I mean, through friends!” “Uh, at summer camp!” Without fail, just as my blathering really hits rock-bottom–“Actually, he was stalking me. Isn’t that cute?”–it hits me that the truth, well, it might actually be better than the alternative. Or yesterday, to be precise, when I decided to actually try that recipe which I’d pretty much made up as I went along and had no confirmation that the results were repeatable. [Fortunately, though I was predictably slow to “get it,” it wasn’t really the recipe that Alex really interested in.] Lucky me, it’s just perfect. By the way, Alex’s response to the recipe was: “Thanks. That sounds relatively simple. I don’t have a food processor or a hand-mixer, though. I guess I’ll have to cave and buy one or the other, eventually.” Hoo boy, did he ever. Tired of dips that were nothing but cream and egregious amounts of dairy fat, and bored by all of the white bean dips out there that were nothing but bean-swapped hummus, this has got to be one of the first recipes I ever created. Low-fat and or fat-free cream cheese work equally well in here, as does goat cheese or mascarpone. A sprinkle of chives makes it even prettier, but it will disappear quickly, with or without them. Puree everything in a food processor until smooth. Bachelors, your margarita blender will work, too. Serve with baked pita chips. Congrats, you guys! I think it’s so cute the way you both met each other! Let me know if you ever get over how to tell people how you met. JB and I met online 10+ years ago (married over 8 yrs) — long before personal ads and match.com — and it still isn’t rolling off the tongue the way I wish it would. I knew from your iVillage “ask me a question” days that you had met through blogging, but I never knew the real story. That’s adorable! Congratulations on your second anniversary! And why should online (whether your way or the Internet dating way) be any different than a random conversation in Barnes and Noble? Your story is a wonderful one, and it deserves it’s place in the sun! So sweet! And such a nice story. Best wishes and congratulations on your second anniversary! Congratulations! Wishing you many more delicious years. I’ve been reading your blog for a quite a while and almost never comment but couldn’t resist today. Your story of how you met your husband is adorable, and you can be proud of it. I especially like the way you wrote it out here, and included the recipe. Wow, I’ve been lurking around your blog for quite awhile and I never knew you had met through blogging! Fun! I also never knew that you had the same anniversary as my husband and I. We baked cookies together last night while playing a nerdy board game to celebrate, if that makes you feel less geeky. Today we played the same nerdy board game after taking ourselves out to lunch. Yes, lunch, because it’s cheaper than dinner. See, you guys may be nerds, but we’re *cheap* nerds. Ha! My husband and I met online as well. We met on a telnet talker in 1995 and were married in 1997. Ten years in December. At first I was embarrassed a bit to tell people how we met, but now I think it’s funny to see their reaction. Awwwww. This is too sweet. Love the pics. Funny, I was just stalking your flickr photos yesterday and looking at your lovely wedding photos (and pointing out to my husband that we have negatives of our wedding, but no actual copies paper, digital or otherwise). Congratulations! Best wishes to you both on your anniversary, and here’s to many more! that’s delightful – the photos and the story both. happy anniversary!! Congratulations on your anniversary ! Much respect! You guys are too cute. Happy anniversary! You used to write with such wit and elan about your laughably bad dates, it was clearly only a matter of time before some good guy got wise to the whole thing. The Interwebs: Good enough for Al & Tipper, good enough for me. oy, does that make me a scary stalker? Holy crap Ive been reading your blogs a long time. For a long time I regretted not having a really intricate proposal story or how-we-met story. Then I realized I had a really great guy and the fact that I don’t have a cool story to tell doesn’t bother me as much. Congratulations, and happy anniversary! I met my dishwasher/heavy groceries-carrier/husband online, too, but it was his chaise longue that lured me in. What a wonderful story and picture. Would love to see more pictures of you both celebrating! So happy to read a happy love story………………. I’ve been reading since The Smitten days, pre-iVillage, and I still can’t get over how sweet it is that you two met through your blogs. It’s the best internet romance out there. Sometimes I feel myself wanting to tell people the how-Deb-met-Alex story, as if I knew you in real life, because it’s just the cutest meet-cute I’ve ever witnessed! Heartfelt congratulations to you guys! Congratulations and happy anniversary! And I simply must try that recipe, yum. I met my fiance on the Internet as well, though not over a recipe, but over Lavalife. I totally feel your pain, there isn’t really a graceful way to say we met online, and I always feel the urge to qualify it or explain why I was looking to meet someone online, or something. We have friends who just got married who met on Lavalife, and they have never told anyone except us that that’s where they met! You’ve been together for more than 3 years haven’t you? So cute! (yes the dip as well). Happy anniversary! I too have been reading since the beginning – who needs a story – you’ve got the man, you’ve got the happiness, and you’ve got the skills to make one hell of an empty stomach feel like the luckiest organ in the world – Besides, my husband, who was able to vote when I was born, just happens to be my professor from college… And when people ask what grade I got in his class, I become quiet and with a slight whisper say “I got a B” – And that was only 1 of 3 B’s I got in college… Our story is wonderful for him since he nabbed the young student… Doesn’t sound so good for me, but I love him and sharing it regardless… Happy Anniversary Deb and Alex!!! I too have been reading since the Smitten days and sometimes wish I could go back and read some of your posts like I often do when I miss an already read book. Your story is better than fiction. If you ever think about doing a full archive, I would be delighted. But, I also understand if it’s a chapter you would like to close to all of your new readers. It’s been fun watching the evolution! Happy Anniversary! Love this story. I think internet meeting/dating is becoming less and less taboo…or it should be anyway. I know a lot of peeps in happy relationships from the online. Congratulations on two very sweet years together! My boyfriend and I also met online and I always hesitate to say so. We met playing cribbage of all crazy things. But, bottom line, it doesn’t matter how you met. It really only matters that you DID. And that recipe looks beautiful, not just because I love cream cheese. Your last paragraph had me cracking up. Especially the last line. What a great story! Happy Anniversary to you both. Happy happy happy day! You must give me the restaurant/present scoop tomorrow. I love you both very much and am so happy I got to see you last weekend. Sheba sends slobbery kisses. Congrats! I remember your old blog, where I found you, right after you got hitched. I can’t believe that two years has sped by, but that’s what happens when life is great. Awww, that’s a great story – don’t be embarrassed. Plus the dip sounds phenomenal – and so easy, too, which I happen to love (full-time work + husband + 5 year old, both picky eaters, = not easy to make involved recipes). Happy anniversary, Deb!!! I do know the awkwardness that comes when you have to say you met your bf/husband online, but I agree with everyone, itÃ‚Â´s good that you guys met, and knowing the whole story, itÃ‚Â´s a cute story too, so I say just stick to a quick phrase like “we met through our blogs” and leave them wondering, instead of leaving you hating your big moth! My hubby and I will celebrate our first anniversary on Sunday. While we didn’t meet over a recipe, we sure do like to cook together. Congratulations! I’ve been reading you since the “50 Ways to Leave Your Lover” post, lo, those many years ago. I loved smitten and I’ve loved smittenkitchen. Thank you for sharp writing and the excellent culinary skills! Am I the only gay man here to think that he’s GORGEOUS!!! I know what you mean-I’m a bit embarrassed to tell people that you and I met online, too. aww, i love this story. happy anniversary! Well, then call me dorkalicious too, as I met Mike on the Internet and yes, it was one of those ‘Find your true love! !’ sites so it’s doubly dorky, and I will one up you in the ‘awwww’ factor, as within the first two minutes of our first ever phone conversation, we discovered we lived one block away from each other. One. Block. We just celebrated our 5th anniversary. Congrats on yours as well, and I raise a glass to you and Alex for many, many more delicious ones. Great story — happy anniversary! Happy Anniversary! My sweetie and I met online three years ago. And my brother and his wife met online as well. So really? Not that dorky. But the recipe story – very cute! My partner and I, together 10 years in October, walked into each other in a hotel lobby in New York in 1997. Neither of us lived in New York at the time. In fact, neither of us have ever lived in the USA. Happy Anniversary to the Smittens. Larry and i met in a chat room almost 10 years ago. we will be married 7 years in october. we say that we learned to know each other from the inside out/ not the outside in……as we had no photos to see each other. happy to see you are as happy as we are…..
Food and the Internet: two of my favorite things bring so many people together. Warms my bitter recent-grad heart. Happy Anniversary! My 1 year is coming up next month. I can’t wait to eat top of our wedding cake that’s been in our freezer for the past year. happy anniversary:). Time definitely flies. I also met my husband online 3.5 years ago and. . .we just celebrated 3 years of marriage and it’s still awkward to tell people that we met through our blogs and mutual blogging friends. Nothing dorky about it, Smitty. And people meet in odd ways all the time. I met my wife because she couldn’t believe that someone would slime the guy who ran our company — you may have heard of him as a former presidential candidate and also right wing conservative from Texas — while sitting in the middle of our corporate headquarters. I, on the other hand, said to myself that I would never like a woman who was a math major and liked walking in the rain. 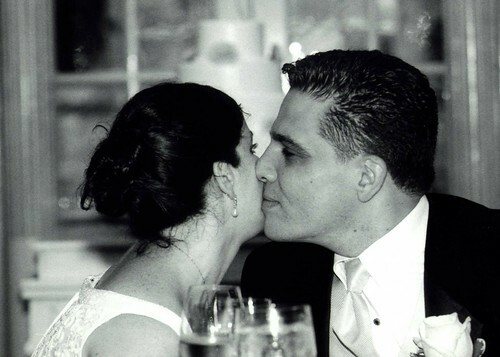 Twenty-three years and counting, and we’re still smitten. Glad you are, too. Congratulations! That isn’t new thing to this world t hat people meet trough the interent, i mean, that’s cute! I have friends who met same way and got married…. We live in the new world, so lets enjoy it. I’ll have to try the cake under this post. I’ve been reading you for months now, but somehow I’ve never seen a picture of you before. Y’all are so cute! And you look so young (though you may be young, I haven’t the slightest idea how old you are). Thanks for sharing, and congrats on two years. Congratulations to you both! We have one of those weird, almost embarrasing stories of how we met, too. You know, though, at least it’s good for some conversation every now and again. Wow – yesterday was my 2yr anniversary also! Congratulations :-). We celebrated by staying in, making crepes with nectarines, brie, and amaretto-spike mascarpone, and postulating boozily about the opposed floating-vs-sinking tendencies of nectarine bits in our respective glasses of champagne. As far as meeting online goes, ah hell with it. Tell the story proudly. It’s fabulous. And besides, things have changed enormously in the last three years. After all, back then there were about 12 food blogs total. Not now! I met the Chef online. That was only the starting point. He read my blog before he met me. That fueled the fire. By the time we met, we already felt familiar to each other. When it’s the right one, this little internet thing is a useful tool! Happy happy happy to you both. You are the most lovely sweet dorks ever. Here’s to many more! Awww that’s sweet, although I get the “it sounds weird to say” part. Me, I met my husband in a bar – which sounds just as bad. So you don’t get a cute when Harry met Sally type couple story… But hey, better an awkward “how we met” story and a happy marriage than vice versa. Lovely picture – I wish you both many happy years ahead! I don’t think I ever mentioned, but because of your blog and the pictures, I ended up getting those clear bubbly bowls, etc, for my brother and his new wife when they got married. Thank you! They loved them (as do I – hopefully my husband will take the hint). Congrats on your anniversary! I subbed in yogurt for the cream cheese in the dip (strained the yogurt overnight in cheese cloth so it would be nice and creamy). Yum! Thank you for all the great recipes. We are having the lentils in curry tomatoes this weekend. I often read your posts to my fav husband (well, my only husband) and your anniversary post led me way back to ivillage to follow your history. You two have truly grown and bloomed. By the way, if we are having a dork love contest – does the fact that my husband and I argue over which is the better thesaurus – Roget’s International, or Roget’s Super Thesaurus, count for something? Wishing you a lifetime of great food and love! Congratulations! Love that you shared the story. As a newlywed, I met my hubby online as well–and my nieces and nephews acted this out with props at our rehearsal dinner. It was very funny–and the younger generation definitely understands it. I felt obliged to point out,4 more couples in attendance had met online (for the under 40 set, it was about a 50% ratio). One of my friends is engaged to her husband who contacted her through her blog, and she also got a new job through her blog. It’s great to put yourself out there in the world. Awww, Happy Anniversary, Smitten! I’ve had you bookmarked for long enough to remember your beautiful tale from the beginning. (Yeah, that feels a little weird to admit but it makes the world truly smaller which makes me happy.) Many, many more beautiful days for you both! Mazel Tov! I just made this, and it seems a little wet. Did you drain the beans first? I didn’t so maybe that’s my problem. What size jar is the “small jar of roasted red peppers”? This looks yummy and possibly something I could add to the appetizer menu where I work. I just made this dip, and WOW! 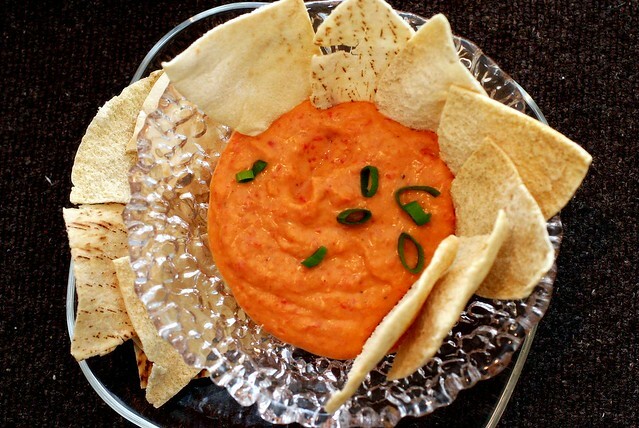 My kids LOVE roasted red pepper dip, but the ones from the store are expensive and very high in fat. I think this is a way I can sneak beans into my younger step son – woo hoo! Suzanne, I used the 1 cup measurement suggested but added a couple more – but I also probably put in an extra ounce of cream cheese (I was using up some left in the fridge). I make my own roasted red peppers and jar them, so they are not quite as soft as the commercially done ones. Even so, the texture of the dip is excellent! Oh and I should have mentioned that I also met my husband online (through an online dating service) and we are very proud of the fact that we met on the internet, bought my engagement and wedding rings online, and now, conduct a long distance marriage aided by – email and the internet! Tis the modern way, my dear! Deb, this is a beautiful post. this came out way too thin for me, even though i did drain the beans, and the peppers! maybe i should have squished all the liquid out of the peppers? or maybe next time i’ll use more beans, less peppers? anyway, tasty, but a bit soupy. Mazel tov, on your anniversary! I’m a kosher cook, and love your recipes, your writting and of course great photos. I have in my freezer, ready for Rosh Hoshana, 2 loaves of your honey cake. Today my teenage daughter is preparing your challah for our shabbos meal. We are meeting my son’s girlfriend for the first time and I’m on your website looking for recipes to impress…….. I made this. The taste was good, it was so easy, but mine was soupy, too. I will try it again though…. maybe it was me and I just didn’t get enough liquid out. Made this, loved it. Used 3 cloves of garlic and added cayenne pepper and red pepper flakes for more heat. It’s gone now. Must make more soon. Thanks! I met my BF of 6 months on line. I sometimes experience the same embarrassment when asked “how did you meet?” and then I remind myself that I should just be happy I have such a great guy :) Conrgrats to you both. Delicious. Perfect consistency after draining the beans and peppers through a fine mesh sieve prior to pureeing. I too added a dash of cayenne and red pepper flakes and think the heat opened up the other flavors very nicely. Thanks. I made this for a “Ladies’ night” get together with my friends, and served it with pita chips (store bought, I cheated) and veggies. It was delicious, and my friends loved it. This is so much better than the spinach-artichoke dip I resorted to making for our last few get-togethers. Just made this with Crystal hot sauce in place of the lemon juice — delicious. Thanks, Deb! Oh i like this story a lot! I knew OF my boyfriend before (we had a lot of mutual friends) but things started rolling when he randomly added me on facebook, and then (after finding the link on facebook) started commenting on my blog! I will forever be indebted to my blog for that!! I just made this, for a solstice party I’m throwing tomorrow. It’s very tasty, but way too soupy to use as a dip! I followed the recipe faithfully, too. Does it get harder in the fridge as the cream cheese firms up? Or maybe I should just toss in another can of beans? Yes, totally drained them! I ended up adding another can of beans and some more garlic, and I think it will be fine. This will be the fourth time I’ve made this rcipe this month. It is a wonderfully easy and different dip — not what people expect! I have learned from all this experience that draining the peppers very very very well staves off the soupiness. Drain the beans well, too. You can always add some liquid later, if need be. An extra clove of garlic and a dash or four of hot sauce of some kind zips it up a bit more for those of us who need more zip. A great recipe like this is a great gift. Thanks! This is a great dip! I’ve made it several times over the holidays (and am getting ready to make it again today) and serve it with pita chips and vegetables. Thank you. I made the dip yesterday for the guests. Used herbs & garlic goat cheese instead of cream cheese. The ingredients combination sounded good, but turned out extremely bland. The roasted pepper didn’t contribute anything to the flavor– it was still a plain bean dip. I added cayenne, cumin, paprika, more garlic and some creme fraiche. With all the doctoring, the end result was acceptable. A lifesaver! Made this last-minute for unexpected guests when I realized that I had chips…and nothing else. Fortunately, I’d come across this post recently and knew I had the ingredients. I subbed sour cream for cream cheese and added some scallions. I didn’t find it to be bland at all (though you do need to like the flavor of white beans). Thanks, Deb! How many cups does this recipe make? My sis and I whipped up a bunch of your appetizers for our parents’ 40th anniversary party, and they all turned out great. The addition of sundried tomatoes to this one gave it extra zing! Simple (if you have time) to make your own pita chips too. I never knew any of this about your betrothed! How wonderful. And I certainly hope you’re over any silly awkwardness about how you met – he’s a wonderful man (and now father! ), so who gives a hoot! Question about the recipe – I didn’t drain the beans as the recipe doesn’t mention to do that but the dip seems like there is a little too much liquid. Any advice? Cute story by the way. Made the dip for my bookgroup….used goat cheese and added some allepo pepper instead of black pepper….It is totally addictive! Has anyone tried this without the cream cheese? Seems like it ought to be okay. Made this today and the flavor was awesome! It was dippier than I expected…I was thinking more hummous-y texture but mine was a little thin. That could also be because I didn’t really measure the roasted pepper (I just took a whole red pepper and roasted it on our gas stove and then put it in). Going to make the flatbread to go with the leftovers! Subbed greek yogurt for the cream cheese, and the result was slightly less flavorful than I had expected. But some smoked paprika fixed that right up! I just made this for the new year’s day festivities tomorrow. I added a good dose of smoked paprika, and it’s divine. Should be even better by tomorrow. Made this last night for New Year’s gathering with another couple who are true foodies; disappeared without a trace. Used lower fat cream cheese and snipped the green ends of green onions for a garnish. Just wished the pita chips I had bought hadn’t been so smushed into little pieces. Will probably make my own next time. A great alternative to hummus, which has become so ubiquitous. This looked so good but I’m sad as mine came out super runny and a vaguely pink vomit color, nothing like the pretty orange in the pictures even though I followed the recipe exactly… hmmm. Any advice? Thank you for this. I always keep the peppers and beans in my pantry so I can whip this out with zero notice. I can make this in a flash and usually do. The color is vivid and happy amid the regular old cheese plates. Hi Deb, I’m sorry but I had the same issues as Liz (113) — drained beans and all. I squeeze the heck out of the peppers using my hands so that it doesn’t come out too runny. Any suggestions on making this dairy-free? Should I just leave out the cream cheese – or should something be added in its place? Congrats and to many more blissful life together. hi….looks delicious, and I’ll definitely make it. would you consider it suitable for rosh hashannah? and would you serve it with pita’s? Happiest of Anniversaries. I would say meeting ‘over the Internet– via your blogs’– isnt’ as dorky as meeting at the blood bank– which is where I met my late husband. For the record, he was giving, I was doing the taking! Happy 10th Anniversary. Today is my 10th anniversary too. It was a beautiful Sunday all those years ago! When people ask me how my husband and I met, I say that we were INTRODUCED on the internet/a dating site. But that is NOT how we met. We met in person on a let’s-meet-for-a-drink-after-work date. After we’d talked by email for about 2 weeks. On that date we talked for 4 hours and he insisted on driving me to my car, even though I said “but you could be Jack The Ripper!” but I knew already that he was honest and kind because he gave me his business card 30 minutes into our date. And even then I didn’t tell him my last name till a couple of weeks later. So: introduced on the internet; met in person, just like old-fashioned people. Together 6 years; married almost 1. The end. p.s. love your recipes, site, stories, humour!! p.p.s. I’ve been subscribed to you for years but only just saw this recipe today as I needed a new dip for a party this weekend. me roasting (and I don’t me cooking but rather rather having a fight, yelling at) my then-boyfriend when up walks this guy (who knew my boyfriend). Well, happy 12th anniversary! He turned out to be a keeper, as did mine and mine has been around 54 years (as of Wednesday)! Oh, the bean dip sounds delicious! Much friendlier story than mine. 1st off….I worked at the Renaissance Faire (the original one). This was before it opened. I was yelling at my then-boyfriend: I mean, up one side and down the other yelling (don’t remember why now), swear words probably happened . Up walks this guy who knew my boyfriend…he’d come to see him about something. Well, you can’t say my husband didn’t know I had a temper and wasn’t afraid to use it, can you? OMG I wanna see more wedding pics! I used goat cheese and brought this to work, it was amazing. I noticed most of your newer recipes recommend roasting red peppers in the oven or charring them on the stove rather than buying them in a jar – would that be a good idea for this one too, or do the jarred peppers blend up smoother? Also, I was estimating about 1 large pepper – does that sound right? love the story! the dip sounds great too! my friend met her husband to be on line and he told her son that he bought her on line! I just made this dip, and it is the simplest, easiest, tastiest dip I have ever made! I did not change one thing, and you’re right! It’s perfect! I’m so glad you two found each other! Congratulations and heartiest best wishes for many, many more!